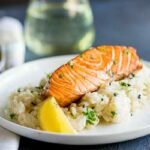 This seared salmon with lemon risotto is an elegant main course perfect for entertaining or if you are spending date night at home. 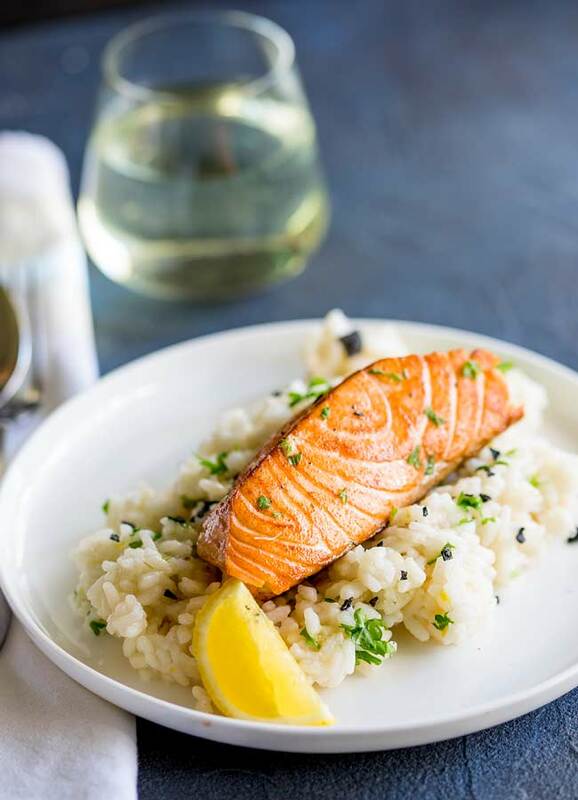 A creamy risotto and a crispy seared salmon fillet, all coming together with plenty of lemon, parsley and black pepper. Pan searing is such a great way to cook salmon. The exterior gets all crisp whilst the inside remains soft, tender and melt in the mouth. My top tips for searing salmon. Use a non-stick pan. It really does make all the difference. You can get a crisp exterior without the worry and stress of your salmon sticking. Lightly oil the salmon, this will make it easier to crisp it up, without filling your kitchen with the smell of smoking oil. Season your salmon lightly with salt, but don’t add any pepper as the heat of the fry pan will burn the spice. Remove the salmon from the fridge for at least 15 minutes before you want to cook it. This ensures it isn’t cold when it goes into the pan. making it less likely to stick and also keeping the cooking time down. Making risotto isn’t as scary as many people think. It is a relaxing job of stirring. For my essential tips for making risotto check out my simple risotto post. Risotto doesn’t need cream, the creamy texture comes from the frequent stirring of the rice and the beating in of butter at the end of the cooking time. When you leave your risotto to rest, make sure you take the pan off the hob (even after it is switched off) the residual heat of the hob can easily spoil your risotto. The quality of your risotto comes from the quality of your stock, use the best you can. p.s If you are looking a seared salmon recipe but don’t want to make a risotto, try our Seared Salmon with Peas and Chorizo. It is so bright and colourful but so simple to make. And for another super colourful meal, check out my beets risotto. It is such a wonderful pink color it has to be seen to be believed. Plus it is a post that is very close to my heart. Heat the oil in a heavy based pan or skillet. Add the garlic and onion and sauté over a medium-low heat for 3-4 minutes or until softened but not colored. Turn heat up to high, add in the rice and stir until the grains look almost glassy. Add wine and cook for 2 minutes until the alcohol has evaporated. Turn heat down to medium low. Add 1/2 cup of stock and stir slowly until absorbed. Repeat until you have used 3 1/2 cups of stock. Check the rice, it should be cooked through but still firm rather than stodgy and almost cooked. Remove the rice from the heat whilst you cook the salmon. Heat the olive oil in a non-stick pan. Season the salmon generously with salt. Cook the salmon for 3 minutes then turn and cook for a further 3 minutes. Remove from the pan and tent with foil whilst you finish the risotto. Once the salmon is cooked. Add the remaining stock to the risotto and stir over a gentle heat. Add in the butter, and the juice and zest of 2 lemons. Stir vigorously to create a luscious creamy risotto. Spoon out the risotto and top with the cooked salmon, plenty of fresh parsley and a good grinding of black pepper. The quality of your stock really dictate the quality of your risotto. If I have it I liked to used homemade shrimp stock, but a good quality store bought vegetable stock will work. So do you remember how I once told you risotto was my solitary treat? My family are just not convinced of it merits! Turns out my farther-in-law loves risotto, but doesn’t get it because my MIL doesn’t. SO when they were visiting over Christmas I served it a few times as a side dish. Along with potatoes or this pasta for everyone else. And a funny thing happened, slowly the small serving I made stopped serving my FIL and I!!! As everyone else started trying it and eating it. So whilst I wouldn’t say it was their favorite dish risotto is now a family friendly recipe! WOO! Seriously this is massive people! Before this I would only make it when we had guests over and even then as a side dish with alternatives. 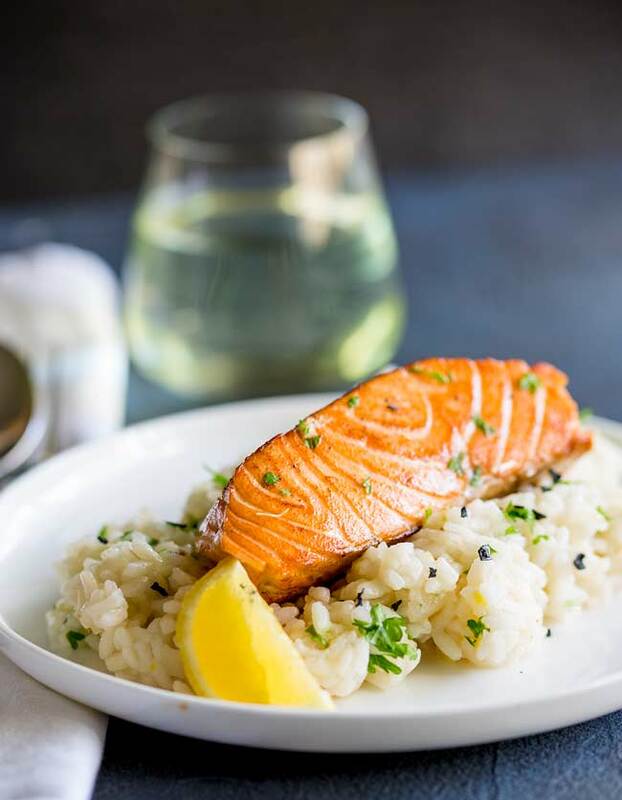 If you love food why not subscribe to my newsletter, I will drop you an email every now and then, just to say hi and send you a couple of recipes think you might love, like this Seared Salmon with Lemon Risotto. 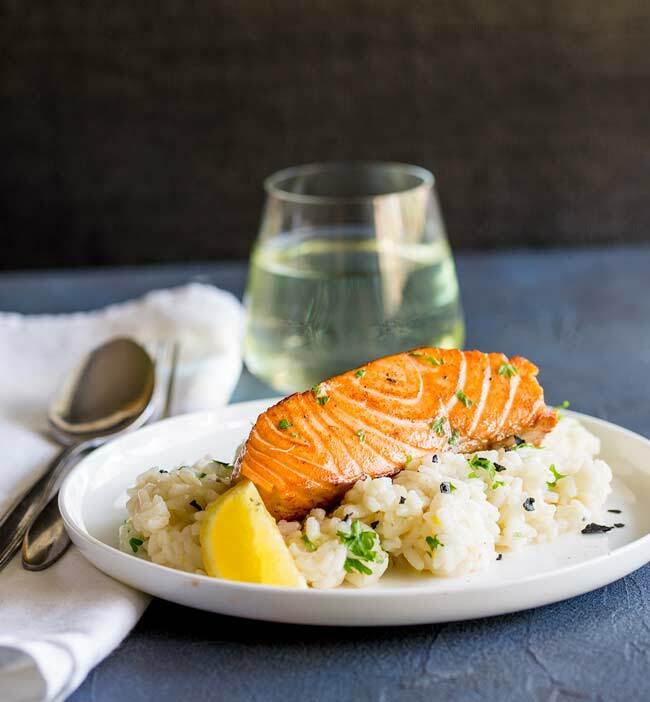 I do love how you present your seared salmon, Lemon Risotto sounds a great side. I’m actually a fond of eating seafood including salmon. I hope you’ll get a chance to post a buttered shrimp soon. Thank you Alex. We love seafood too! Ohhhh buttered shrimp, yes I really must! Oh my goodness! 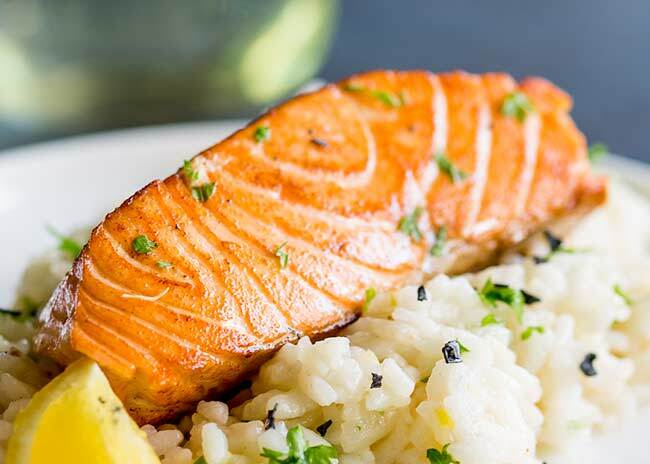 This salmon looks so delicious and we love the lemon risotto. SO good for a yummy and quick weeknight meal. You gave me a different way to cook salmon. I usually cook it on a cedar plank on the grill! Oh I just love salmon cooked on a cedar plank!!! This looks so delicious! Great tips for salmon too! it is such a great combination of flavours isn’t it. This is a perfectly delicious meal, and we since we eat salmon often, pan searing it is one of our favorite techniques. I’m going to have to try your lemon risotto – it sounds wonderful! I’ve made mushroom risotto before but never lemon. Mushroom risotto is so good! And one of my favs….I am sure you will love lemon risotto it is so fresh. Looking forward to trying this recipe. I love salmon and am always wanting new ways to prepare. Salmon is such a delicious healthy dinner idea isn’t it! You are welcome Traci, hope you enjoy it. I love salmon (who doesn’t!?) but have never had much success pan-frying it. I love your tips on that, especially to remove it from the fridge ~15 minutes in advance. I always do that with chicken breasts, which works wonderfully, don’t know why I never thought to try it with salmon! Great tip for a great recipe – that risotto, too! I hardly know which is my favorite part! Thank you Monica! Salmon is one of our favourites too. This salmon looks absolutely perfect! We eat salmon at least once a week and I’m always looking for new ways to prepare it. Thanks for the mouthwatering recipe! I have seen people do that on the cooking stands we sometimes get at the supermarkets here. I always thought it was so they didn’t have to keep washing the pan. But it makes so much sense that it prevents fish from sticking!! !